Gift Vouchers - Ideal present for birthdays, Christmas or just because. Our artisan gift vouchers are an ideal present for birthdays, Christmas or just because. Give the gift of hand-made arts and crafts, from suncatchers, to earrings and bookmarks. What treat would that special person love? Wherever you live and wherever your friend or family member lives, our vouchers are for you. You can purchase a .pdf voucher directly from us which will have a specific voucher code that can be redeemed once. Please contact Nicola using the online form with the amount you would like to purchase, your location and the payment method (Paypal or UK cheque). The voucher must be sent to your email address as the purchaser. The voucher will be sent as a .pdf file, please ensure your computer/device can read this type of document before you purchase. Gift vouchers are non-refundable / non-transferable. Cannot be substituted for cash. 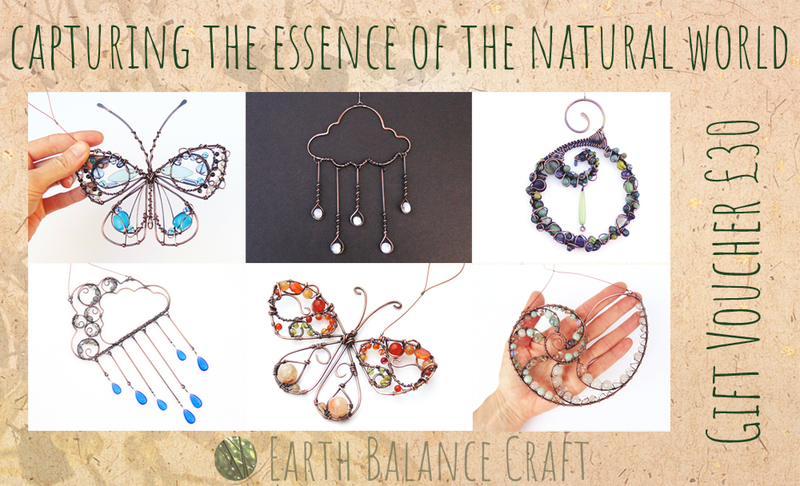 For use with Earth Balance Craft via the www.earthbalance-craft.co.uk website only. Please read the terms and conditions of online sales before you purchase a gift voucher. All gift vouchers are valid for one year from date of purchase.